Lathamar Holi takes place well before the actual Holi celebration and is observed in Barsana Village in Mathura in Uttar Pradesh. Lathmar Holi 2019 date is March 15 and March 16. The famous stick fight between men from Nandgaon and women of Barsana take place on the day. The aim of the men from Nandgaon is to install a flag on the temple of Radha at Barsana and claim victory. Women of Barsana face them with bamboo sticks. In 2019, Holi festival is on March 21. Holika Dahan in North India is on March 20. If you are a tourist or foreigner visiting for Lathmar Holi then be prepared to spend at least three days. The legend behind Lathmar Holi is closely associated with Lord Krishna and Radha. It is said that Krishna, who is dark in color, was jealous of the fair-colored Radha. Krishna used to pester Mother Yasodha with questions on Radha’s skin color. Once fed up, she said to Krishna that he can change her skin tone by sprinkling color. Krishna and friends used this opportunity to create pranks on Radha and friends. How is Lathmar Holi observed? The festival does not begin as such invitations are send from both sides to play Holi. The women from Barsana send the invitation along with sweets, gulal, itar, matri, puwa and other local delicacies. In Lathmar Holi, men in traditional dress from Nandgaon adorn the role of gops (friends of Krishna). In Barsana, women adorn the role of gopis (friends of Radha). The men wearing colorful dress reach Barsana carrying lathi or sticks and shield to defend themselves. They throw colors on women and the women fight back with batons. Both men and women prepare for Lathmar Holi in advance. Each year, new methods are employed in Lathmar Holi to outwit each other. The men are well padded because they cannot hit back and can only try to keep the women off by sprinkling colored water on them. In case if a man gets trapped, he is made to dress like a woman a sari with all cosmetics and is made to dance like a woman. It is said that even Lord Krishna was made to dance like this by the ‘gopis’ of Barsana. Women dress up in Solah Shringar for the occasion. Next day, the women return to play Holi with men in Nandgaon. Usually people do not get hurt on the occasion but if someone does get hurt they apply mud and return back to take part in the festival. Bhang and Tandai are served lavishly during the occasion. Lathmar Holi is celebrated across several villages in Mathura. But the one at Barsana is the most famous. Barsana, Nandagaon, Vrindavan in the Braj area was the playground of Krishna and Radha and their friends. 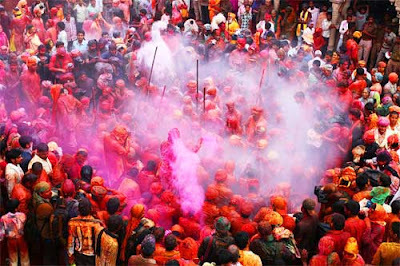 Holi in this region is noted for mirth, color and reenactment of the antics of Krishna, Radha, Gopis and Gopas. When is Lathmar Holi Observed? It is observed on the Navami and Dasami tithi before Holi. The ninth and tenth day of the fortnight before Holi festival. On the ninth day - men of Nandgaon go to Barsana to play. The men are invited traditionally by the people of Barsana. On the tenth day - men of Barsana go to Nandgaon to play Lathmar Holi. After this both men and women play Holi at Nand Chowk. Barsana Village is around 45 km northwest of Mathura Town in Uttar Pradesh.